November through March is a time for exciting holidays, winter wonderland and bundling up. It can also be a time for driving in the snow. Winter is the busiest time of year for you and your vehicle, and since cars are our specialty, we wanted to share our best driving tips for the snowy weather. How Well Do You Know Your Car ? Is this your first winter together, or are you well acquainted with one another? Either way, it’s important to know the ins and outs of your car’s ability to handle the snow. For starters, you should determine if you have front or all-wheel drive, anti-lock brakes and stability and handling control. Take note of what kind of tires your car is rocking. Are they winter tires? Are they known for their traction in the snow? Take the Penny Test to make sure your tires’ tread depth is where it should be. Test drive your car in an empty parking lot on a snowy day, just to make sure. 1. Make sure your gas tank and windshield washer tank are full. 2. Turn your car on and put the defroster on to melt and soften the ice on your front and rear windshields. 3. Once your car is on, brush off your mirrors, headlights, taillights and license plate. 4. 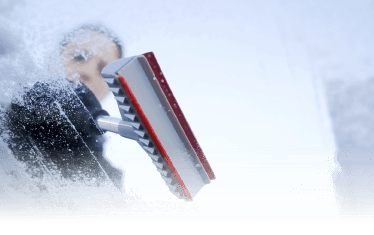 Protect your windshield from the ice and scrape off as much as you can before getting back into your car and using your wiper blades. Remember, hot water is not an option for your windshield, unless you’re into the shattered glass phenomena. 5. It’s key to soften the ice on your windshield before you activate your wipers. It may seem like it’s quicker and easier to just turn your wipers on, but you coud wind up ruining your wiper blades from scraping on the ice. 6. Once your windshields are clear, shovel around your wheels and under the front and rear bumpers to make your departure as smooth as possible. 7. Before you do any driving, make sure your car is prepared for winter. Slow down to leave ample room for braking. Avoid tailgating – stay 2 car lengths behind the vehicle in front of you. Handle getting stuck with care. Stay calm if you skid. Look further ahead than normal. Leave room for maintenance and plows. Always have a working cell phone and emergency kit in the car, in case of emergencies. 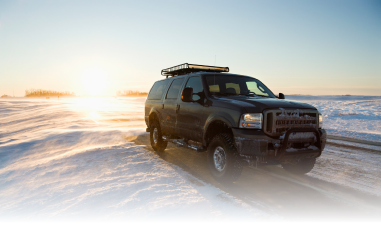 Driving in the snow doesn’t have to be intimidating, just make sure you and your vehicle are prepared. If you think it’s time to get your car checked out before the next snow fall, schedule an appointment with your local Pep Boys.